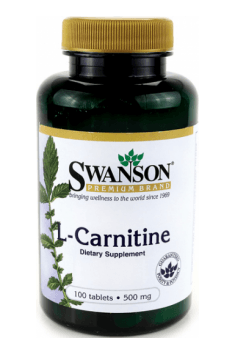 Unlock your potential for a lean, muscular body with Swanson L-Carnitine! A favorite among dieters and bodybuilders, this amazing amino acid helps the body burn fat to energize muscles for effective, productive workouts. One tablet 1-2 times a day one hour before a meal. The supplementation with l-carnitine preparation may become even more effective if it is combined with other preparations containing alpha-lipoic acid, choline or caffeine. A standard dose of l-carnitine is 500-2000 mg, which means that even 1 portion of the product a day, used regularly may cause therapeutic effect. We may increase the preparation effect, combining it with choline, caffeine or alpha-lipoic acid supplementation. Carrier (Calcium Carbonate), Bulking agent (Microcrystalline cellulose), Anti-caking agents (Fatty acids, magnesium salts of fatty acids, silicon dioxide), Thickening substance (Ethyl cellulose), Glazing agent (Shellac).